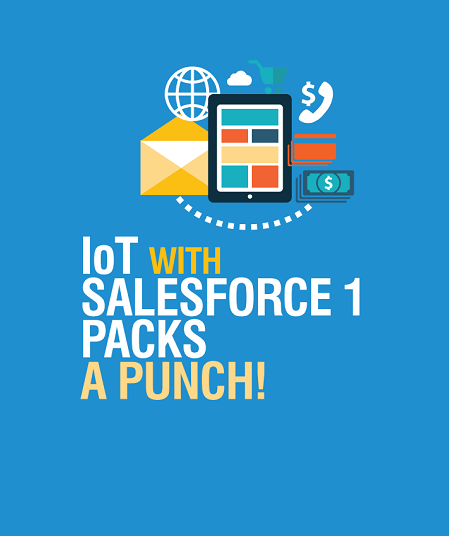 Whitepaper: IoT With Salesforce1 Packs a Punch! IoT With Salesforce1 Packs a Punch! IoT (Internet of Things) is the next big thing that is taking the technology space by storm. And when IoT applications go hand in hand with the Salesforce1 platform, imagine how businesses will benefit! A unified customer experience is on the anvil, and no doubt, enterprises will be out there to grab it first. Salesforce1 goes beyond the making of IoT enabled apps easy. It also allows companies that have already invested in customer apps for their devices to deliver it to their customers in the mobile as well, promising a unified experience. This whitepaper discusses how Salesforce1 enables enterprises to make the most of IoT-powered app, and more! Download your copy now!